There are new approaches to this old practice. They say everything old is new again, and soil sampling is now undergoing its own renaissance. Educational efforts have been ramped up while faster, more precise sampling techniques have been developed. Those efforts are in response to the rapid adoption of variable-rate application technology to help farmers become more efficient and to meet growing environmental concerns. The new focus on soil sampling is reflected in the numbers. In a 2015 summary of soil test levels in North America, the International Plant Nutrition Institute (IPNI) reported that 10 million soil samples were processed by public and private labs last year—a dramatic increase from the annual rate of 3 million found just a decade earlier. The study—which has been repeated 11 times since the late 1960s—shows soil sampling is increasing at a breakneck pace. Prior to 2005, the number of samples increased at a rate of roughly 27,000 per year, but since that time submissions have soared by 750,000 annually. Belton, Missouri farmers Mike, Brian and Mick Effertz are among those who have stepped up their soil sampling program. Last year, the partners invested in an AutoProbe automated soil sampling machine to gain a better understanding of the soil fertility situation existing on their farm. “Soil testing got to be a huge chore and we knew our depth and spacing weren’t consistent so the quality of our sample was suspect, so we traded our $20 soil probe for a $60,000 automated sampling machine. It was a tough decision, especially at today’s commodity prices, but when you look at the value of yields we were losing to under-application and unneeded fertilizer from over-application it quickly made sense,” adds Mike. The AutoProbe unit collects up to 40 pencil-sized soil cores across a 2½-acre grid. Cores are moved pneumatically to the tractor cab where the operator bags and labels them with a geo-referenced bar code before sending to a lab. “We set autosteer to guide our tractor in a diagonal arc across each grid, so we zig-zag our way across the field. In a good day we can sample 350 to 500 acres,” he explains. Good sampling procedures in the field are key to collecting an accurate soil sample. Sample quality. Kansas State University extension agronomist Lucas Haag says the quality of soil test data may be more important now than ever before as farmers suffer through the current low profit margins. “Soil test accuracy is critical in times like these because farmers might have soil test levels that allow them to cut back fertilizer use or only apply a rate based on crop removal, but if they’re soil test is wrong it could be a big mistake,” adds Haag. 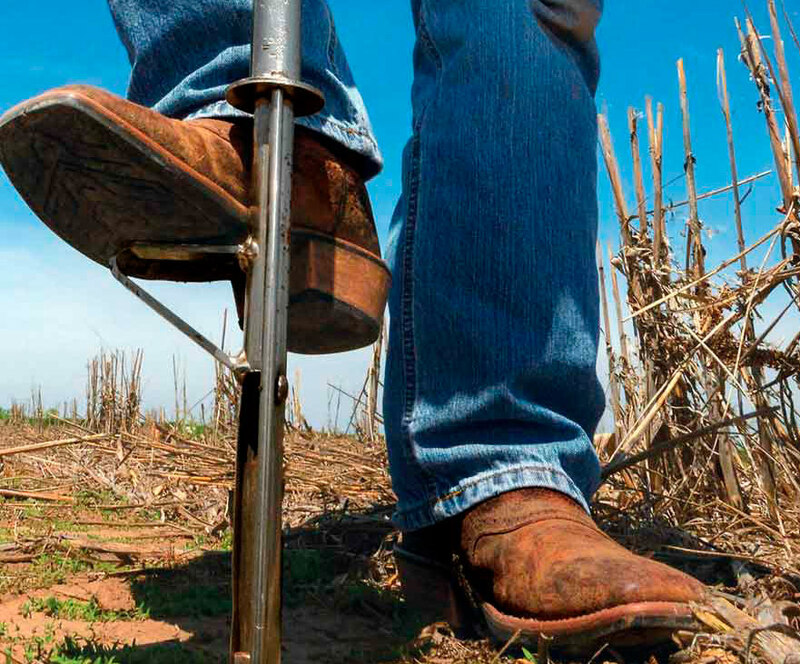 Arnall is analyzing grid-sample soil test information on 180 fields in Oklahoma and Kansas looking for patterns or values that indicate how an investment in grid-sampling would pay. “This would allow a producer to look at values in his whole-field composite sample to determine the potential for grid-sampling,” he explains. A new approach. Concern about potential errors in soil test data has prompted University of Missouri agronomist Peter Scharf to consider an alternative approach to making nutrient management decisions. “On-farm strip trials offer an opportunity to make decisions using evidence directly from the field being managed,” says Scharf. “GPS technology makes it possible to locate reference strips in the field and a yield map can verify the response, or lack of response, to phosphorus application,” says Scharf. “This technique solves some of the uncertainty around soil sampling and the resulting fertilizer recommendation. You no longer have to worry that the sample you send in actually accurately represents your field and you also know that the response curve used to develop the phosphorus rate recommendation comes directly out of your field,” explains Scharf. Scharf has tested the approach on 19 fields in Missouri and his idea recently received funding for additional testing in North Carolina and Ohio. “I’m a strong advocate of a good soil sample, but we think there is considerable potential for producers to reduce spending on phosphorus without reducing yields,” he explains.